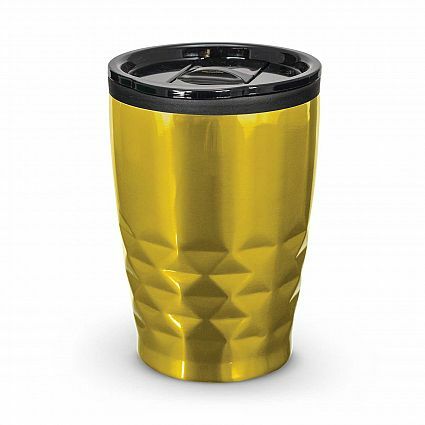 Trendy 400ml cup with double wall construction which will keep coffee hot for longer. It features a smart diamond patterned stainless steel outer wall and a plastic inner wall. Urban has a secure plastic push on lid with a splash proof sliding cover and a soft EVA non-marking base. 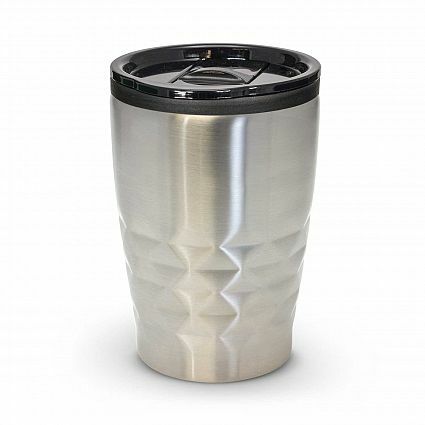 It laser engraves to a stainless steel finish and handwashing is recommended. Colours: Silver, Gunmetal, Gold, White, Red, Green, Teal, Blue, Purple, Black. Dimensions: Dia 80mm x H 125mm. Packaging: Loose packed or an optional gift box.